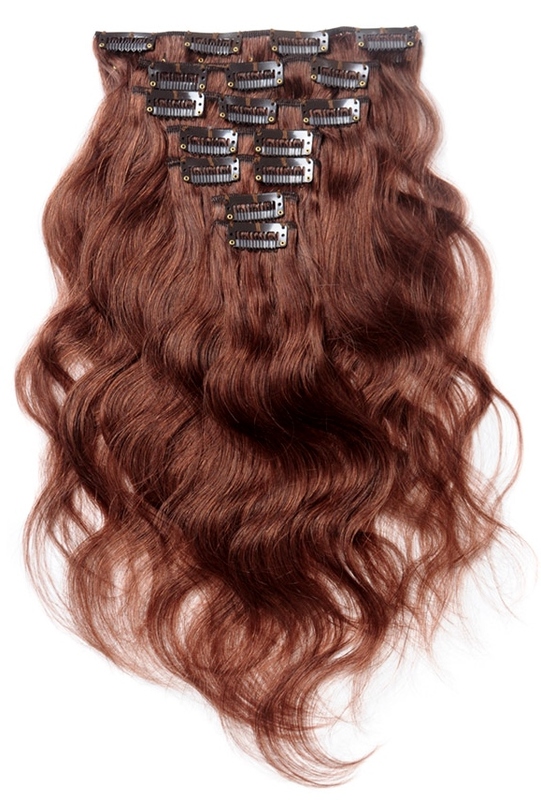 Body wave clip on hair extensions resemble… come si dice… ah yes; waves. The wave pattern is the gentlest of all the created wavy textures (natural straight textured weave hair is even gentler but it's not a chemically created texture) and adds volume to the look of the hair. It’s really proved a winner with folks who like their straight hair with a little more character and texture. The waves are very large or loose so it’s never mistaken for curly hair either at a distance or up close. When wearing clip in hair extensions, blending your natural hair texture with the texture of the hair extensions is important for an authentic look. If you have naturally wavy hair or if you like to add waves to your naturally straight hair, you’ll be able to blend it with your body wave clip in hair extensions. There are naysayers who think body wave clip in hair extensions can’t be worn with straight hair, but you can look at a few top tips to help with blending straight growth hair with body wave clip in hair. Naturally curly textures will blend with body waves if you’re willing to use heat straightening tools to create waves with your natural hair. Much like the other textures for clip in hair extensions, body wave clip hair extensions are available as single wefts which can be as narrow as 1 inch and worn at the sides of the head; and wider wefts which can be up to 9 inches that are worn at the back of the head. Not interested in single width clip in hair extensions? 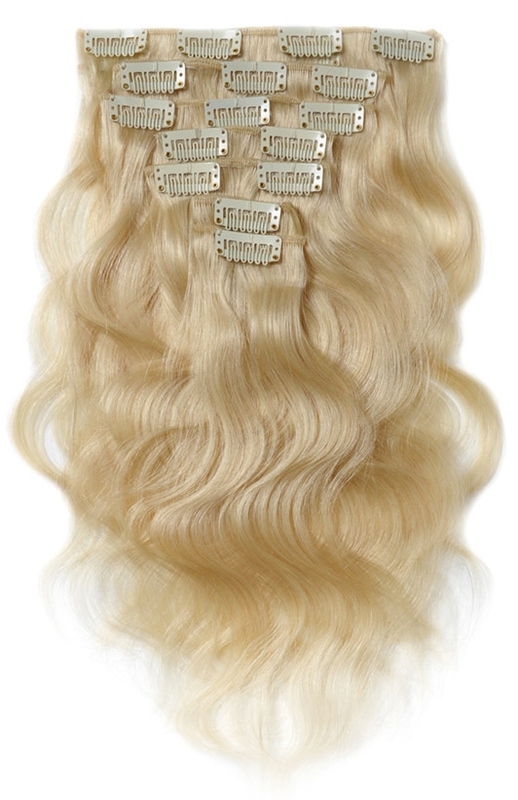 No problem, body wave clip in hair extensions are also available in multi width sets (multi what huh!? Read on and all will become clear). Sets usually have a minimum of seven wefts of varying widths and can have as many as 12 wefts per set. These multi width sets are also available in a variety of densities (density is measured in weight for clip in hair extensions). Single wefts also come in different weights (densities). The larger clips are frequently available in different (weights) densities, so you have the choice of buying a single 8” piece that weighs 90g or 8” piece that weighs about 30g and you can check out images of this here. Body wave clip in hair buffs (or Johnny-come-latelies who’ve read any of our other articles on clip in hair extension textures) will know that the lengths for body wave clip hair extensions range from 8 to 28 inches. Being a body wave buff, you’ll also know that longer lengths can be found… but you have to look for clues and treat finding them like a scavenger hunt. The famous faces of colour show up for body wave clip in hair extensions: Colours 1, 1b, 2, 4, 6, 8, 27, 30, 33, 99j, 613 (blacks, browns burgundy and blondes) as well as T-colours, copper, dip-dye, grey highlights, green, tricolours, pink, ombre and more besides – yay! When buying online, it's worth keeping in mind that different monitors show colours differently so check the listing description and images as not all retailers allow hair extensions to be returned. You can check out Peruke’s Caring For Clip In Hair Extensions Guide and have a butchers at these top five tips to keep your body wave clip hair extensions in top condition. 1. Use a shampoo for chemically treated hair as the waves have been permanently set. 4. Prevent the hair from becoming dry with a water based moisturiser, free from mineral oils. 5. Detangle before washing and at the end of washing (before drying). That's the leap and bound through body wave clip in hair extensions! If you're interest is piqued about clip in hair extensions then check the Hair Extensions Q&A section for more info or keep up with the next guide about clip hair extensions, hairpieces, wigs and weave hair by joining our blog.